It's the _______iest place on Earth? It might seem over-the-top, maybe a little sensationalist; an abandoned seaside resort in in the UK gets transformed (seemingly under the cover of night) into a morbid parody of Disneyland. You might even wonder what makes this art? The most ambitious project by world-famous street-artist and provocateur, Banksy, a pop-art exhibition entitled Dismaland stands to be one of the most inventive and important exhibitions of the past two decades. As this temporary “Bemusement Park” nears its end on September 27th, we look back on the importance of this exhibition. Dismaland is a carbon-copy of all you’d expect of a generic amusement park: a Ferris wheel, a carousel, the souvenirs, the games (as well as the long lines). However, nothing here is as it seems- a twisted distortion of jovial expectations. The rusted rides malfunction; the carousel goes at an unexpected clip while a mannequin makes lasagna of one of the horses. Cinderella’s castle is in shambles; constructed of exposed re-bar and cinder-block. It is more akin to a nightmare than a fairytale. The star attraction: a shocking diorama of the princess’ pumpkin carriage rolled over; her lifeless body being captured by the strobing flashes of the passive paparazzi- an obvious allusion to the car crash that claimed the life of Princess Diana. Dismaland is in no way family-friendly. It’s uncomfortable, it’s gritty and in ways frightening. Unlike the pristine Magic Kingdom, this exhibit is filthy- literally and metaphorically. Profanities are scrawled around the park, the moat is filled with excrement and garbage. The exhibition criticizes the escapism of amusement by confronting us with the harsh realities of society. Taking the blueprint of childhood fantasy, Banksy erodes the magic and the artifice leaving only the devastating reality: the current refugee crisis, pollution, over-consumption and wealth inequalities. Disney may seem like an undeserving target- the beloved and universal icon of childhood. But, that's precisely what makes this exhibit so affective. It is a reminder of what we’d have to tell our children if we didn’t candy-coat childhood with mice and princesses. The meaning of this exhibit is perfectly summed up in Banksy’s succinct artist statement: “Sorry, kids”. Despite the dark themes, the exhibition retains Banksy’s sardonic sense of humor. The Grim Reaper rides a bumper car, the park offers loans to children at a 5000% interest rate. The traditional prize of a goldfish is subverted with a deep-fried fish finger. Most importantly, this exhibition isn't highbrow. You needn’t be an artist or hold a degree in post-modernism to understand it. Despite the dark themes and macabre imagery, the familiarity of the works and the environment render them inviting; the atmosphere of an amusement park is one we can all relate to. Rather than debating the importance of a particular brushstroke in an abstract painting, here we are confronted with familiar images, a built-in frame of reference that makes the work immediately understandable. At its core, this exhibition has all the markings of a Banksy event. The central anti-capitalist and mildly anarchist themes are repeated throughout his oeuvre- in many ways this exhibit is his graffiti rendered in three dimensions. It is also comprised of politically charged artworks that were created by 57 artists personally invited to participate (most notably, controversial artist Damien Hirst). 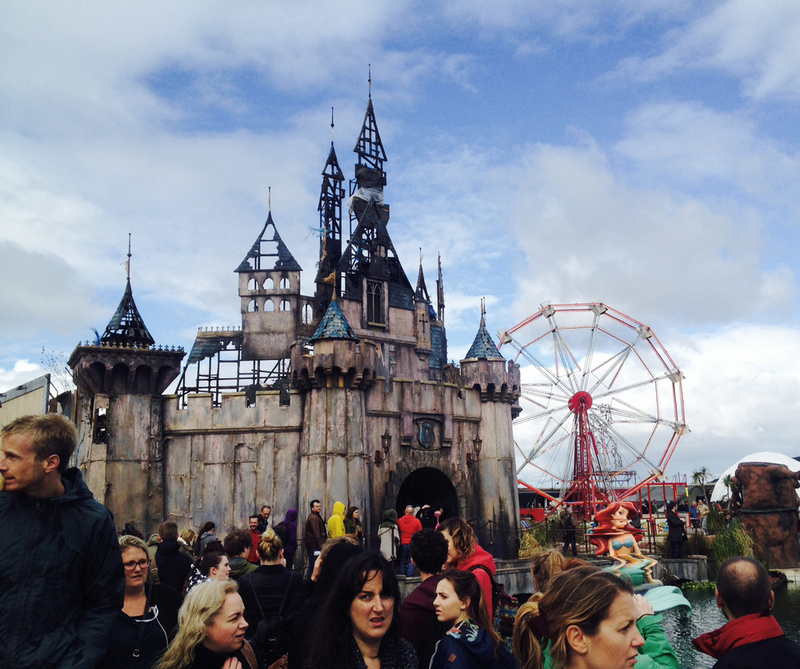 At once, Dismaland is a giant installation, an attraction, a performance piece. Though Banksy is adamant that "museums are terrible places to look at art", the site also contains multiple galleries to display more conventional artworks like paintings and sculptures. Banksy's iconic spray-paint work is displayed throughout the theme park. Wasted Rita's snarky bills are posted all over the grounds. Freed from the confines of the traditional commercial gallery: the white walls, the red dots that indicate sales, the constant pressure of the gallery attendant- this exhibition is experiential, it's site-specific. The works can only be experienced within the larger context of the setting (an amusement park); a revolutionary approach to an art exhibit. Unlike most amusement parks, admission is only £5 and the games and rides cost only £2. It's obvious Dismaland isn't out to turn a profit, but rather be accessible for everyone to see. In keeping with the exhibit’s overarching criticism of consumerism and entertainment- none of the works are for sale. By erasing the expectations of the commercial market, the works are able to make a pure statement. 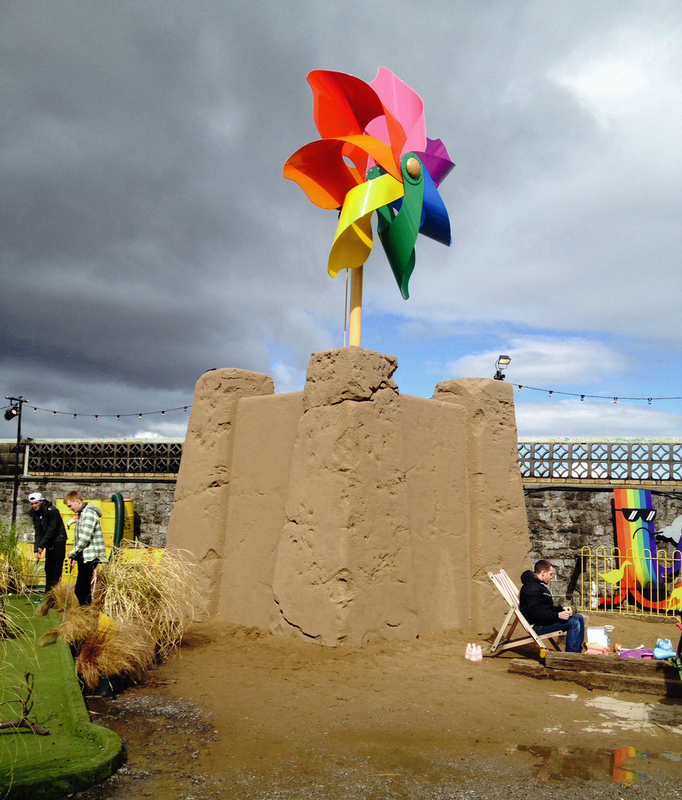 Banksy’s Dismaland proves that art can be democratic – created for everyone. From the low admission rates to the familiar format of a theme park, this isn’t an exhibit designed for the elitist art scene. This exhibition subverts the space in which art is displayed, and demonstrates that art can make an essential statement about the world at large. A big thanks to Allison of She Sees The World for providing us with the photographs in this post.